Lindeth Fell Country House015394 43286work015394 47455fax Guest AccommodationSuperb luxury bed and breakfast accommodation, perfectly located overlooking Lake Windermere. There are 14 individually designed bedrooms each with its own modern, airy bathroom. All have crisp Egyptian cotton bed linen, deluxe fluffy towels, White company bathroom amenities, sherry decanters in the room on arrival, DAB radio / Bluetooth, and flat screen television. Many have superb lake views. All have tea / coffee trays and the Master rooms have Nespresso coffee machines. Start the day with a delicious breakfast served in our sunny dining room, overlooking 7 acres of beautiful gardens and the stunning Coniston mountain range. We offer complimentary tea and scones on arrival and now have a range of cold platters available to pre order in the evenings. We have two cosy lounges with log fires in winter, and a new fully licensed residents bar. We also offer free Spa access to a local leisure facility in Bowness. 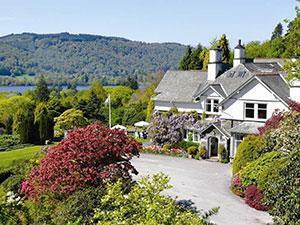 A superb Superior room on the second floor with panoramic views over lake Windermere and Coniston mountain range beyond. Super-king sized bed, can be made up as twin on request. Bathroom with walk in power shower. White company bath products. Egyptian cotton bed linen and deluxe fluffy towels. Robes & slippers.Tea/coffee making facilities. Nespresso coffee. Flat screen TV and DAB radio. Complimentary tea and scones on arrival. Sherry decanter in room on arrival. Haweswater sometimes limits bookings to 3 or more days. 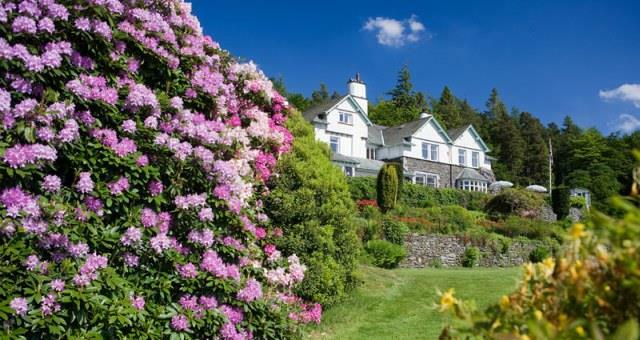 Superb luxury bed and breakfast accommodation, perfectly located overlooking Lake Windermere. There are 14 individually designed bedrooms each with its own modern, airy bathroom. All have crisp Egyptian cotton bed linen, deluxe fluffy towels, White company bathroom amenities, sherry decanters in the room on arrival, DAB radio / Bluetooth, and flat screen television. Many have superb lake views. All have tea / coffee trays and the Master rooms have Nespresso coffee machines. Start the day with a delicious breakfast served in our sunny dining room, overlooking 7 acres of beautiful gardens and the stunning Coniston mountain range. We offer complimentary tea and scones on arrival and now have a range of cold platters available to pre order in the evenings. We have two cosy lounges with log fires in winter, and a new fully licensed residents bar. We also offer free Spa access to a local leisure facility in Bowness.